Failure: TTM 2010, c/o home. So there was no security at Bobcat Stadium in San Marcos where the Riders played. This allowed me to meander down to the front of the stands and onto the field at half time. As Ivory Lee was galloping off to the locker room during half time, I crossed paths with him and asked him for his autograph. He smiled and kept jogging saying, “I got another half of work to do.” After the game he penned this Star Pics card for me. Ivory Lee Brown graduated from tiny Arkansas-Pine Bluff where in his first season he rushed for an incredible 8.3 yards a carry and 1465 yards. 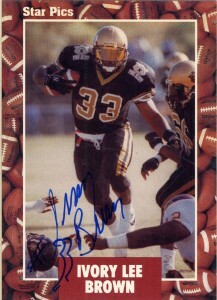 An imposing powerback who could easily be mistaken for a fullback at 6’2″, 245, Brown was selected by the Phoenix Cardinals in the 7th round of the 1991 draft, where he’d be placed on the team’s developmental squad. As the 1992 season opened up in the WLAF, the NFL made available many of its developmental squad members and future stars for the fledgling World League. The San Antonio Riders were looking for a replacement for their previous runningback Ricky Blake– and found the upgrade in the form of Ivory Lee Brown. The Riders were a classic offensive team built around a strong running game and tenacious defense. Ivory Lee would initially share the depth chart in the preseason with Tony Boles- but with Boles MIA by week 3, Brown would shoulder an increased workload for the team. By the end of the season Ivory Lee Brown would lead the WLAF in virtually all rushing categories with 767 yards, 166 carries, a 4.6 average, and 7 touchdowns. His 767 yards would be a league record and he’d be named first team All World League. As the season came to close against the Sacramento Surge, optimism was riding high for the 7-3 Riders that 1993 would be their season- but that would never be as the league folded North American operations and did not reemerge until it was retooled to a strictly European format in 1995. Brown would return to the Cardinals where he’d emerge from the practice squad and be moved into the starting lineup for Phoenix while incumbent runningback Johnny Johnson held out. He’d start 5 games and run for 194 yards and 2 touchdowns in relief of Johnson, but would not be resigned after the season. Brown’s history from there is sort of… a mystery as he drops off the face of the Earth, but from time to time his name comes up in conversation as he’s the uncle to current Minnesota runningback Adrian Peterson. I wrote Ivory in June of 2010 hoping to get the former All WLAF back’s signature on his Wild Card 92 WLAF card at his home address through the Meiselman list, but have been unable to reach him up to this point.